The Celestial King Bed, Dresser, Mirror & Nightstand by Samuel Lawrence at Great American Home Store in the Memphis, TN, Southaven, MS area. Product availability may vary. Contact us for the most current availability on this product. Minimalistic in style, glamorous in appearance, the elegant Celestial Collection from Samuel Lawrence will turn your bedroom into a heavenly retreat. The stunning silver finish on wood surfaces is complemented by faux reptile detailing and polished silver pulls on drawer fronts. 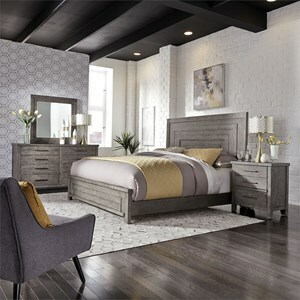 The bed's headboard has a large panel upholstered in an elegant gray fabric, with rhinestone button tufting, framed by the collection’s signature silver finish. The low-profile footboard is also paneled and upholstered. Bending toward bling, but the clean lines and squared bun feet keep it from being overly fussy. The Celestial collection is a great option if you are looking for Glam Contemporary furniture in the Memphis, TN, Southaven, MS area. Browse other items in the Celestial collection from Great American Home Store in the Memphis, TN, Southaven, MS area.